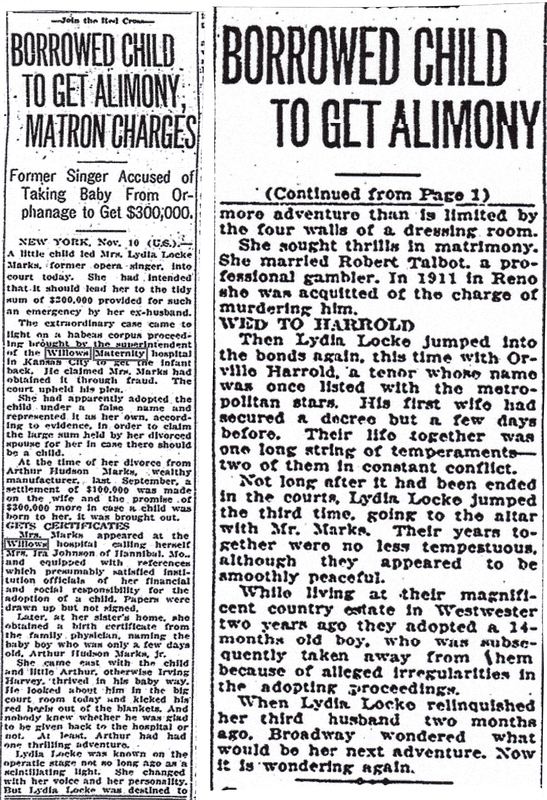 The Marks were divorced in September of 1923. Apparently Miss Locke was mathematically challenged or unaware of the average gestational period for humans, but in October of 1924 she appeared in New York with the baby. 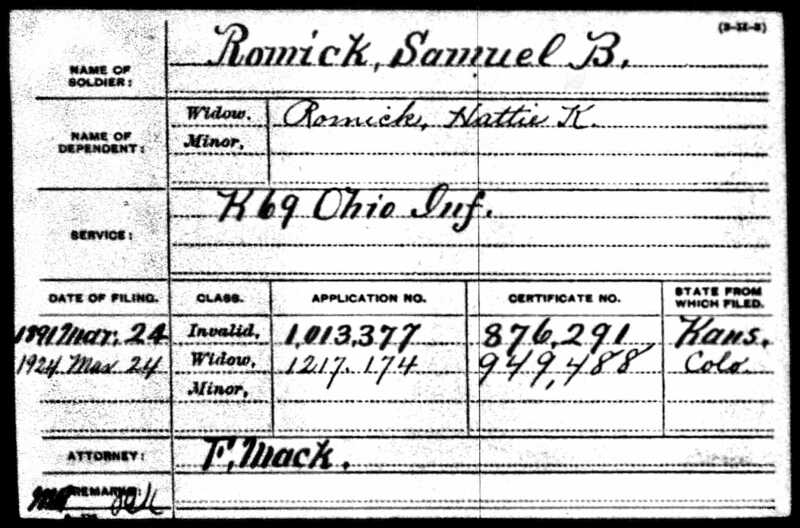 Miss Locke contacted her ex-husband and asked him to acknowledge the baby as his own. 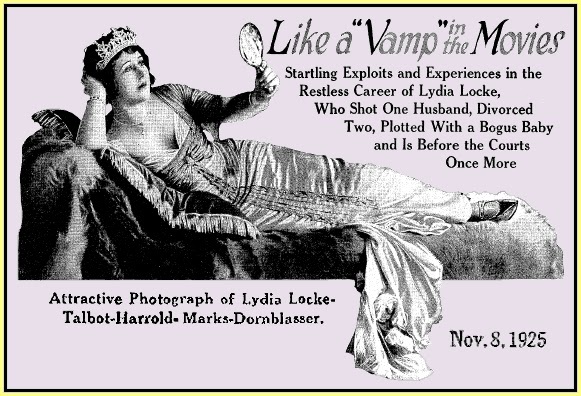 Mr. Marks, not so biologically or mathematically challenged as Miss Locke, employed private detectives to learn how she obtained the baby. 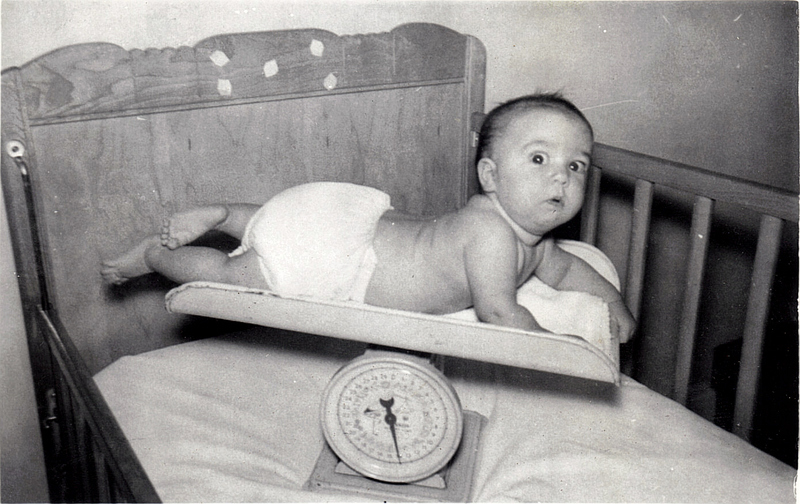 The poor little baby, now six weeks old, was ordered returned to the Willows Maternity Sanitarium. The articles don’t say what became of the infant. In any event, he was better off without the looney Miss Locke. 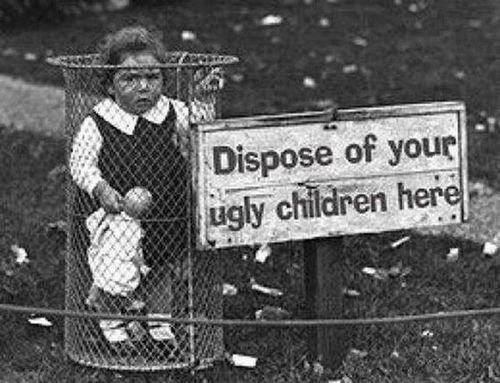 Before adoption became a compassionate process of placing children in healthy homes, it was more like the dog pound. Below is a clipping from 1906 for “The Willows” that reads like a “free to a good home” pet adoption ad. 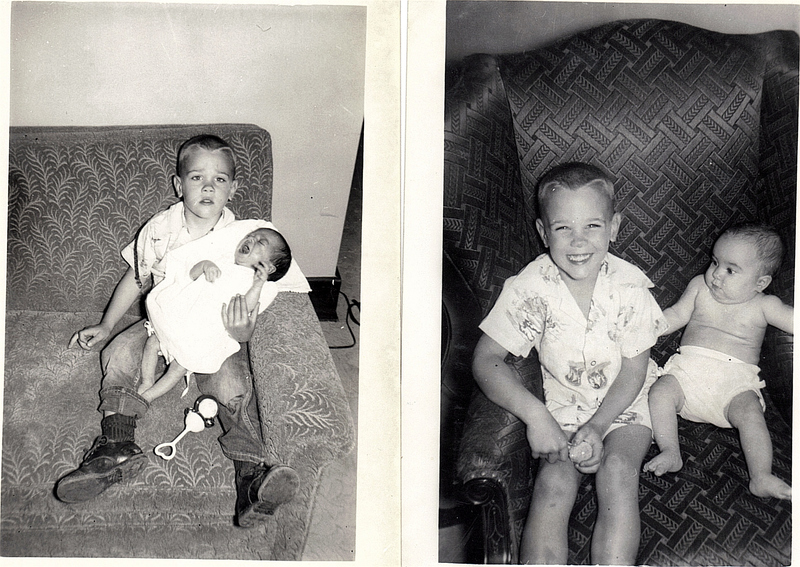 I was born at the Willows Maternity Sanitarium in April and my mother (Grace) took the train back to New Jersey soon after. Grace got married two months later in June and not to my bio. father. She must have had great care at the Willows to be able to get married so quickly after giving birth. 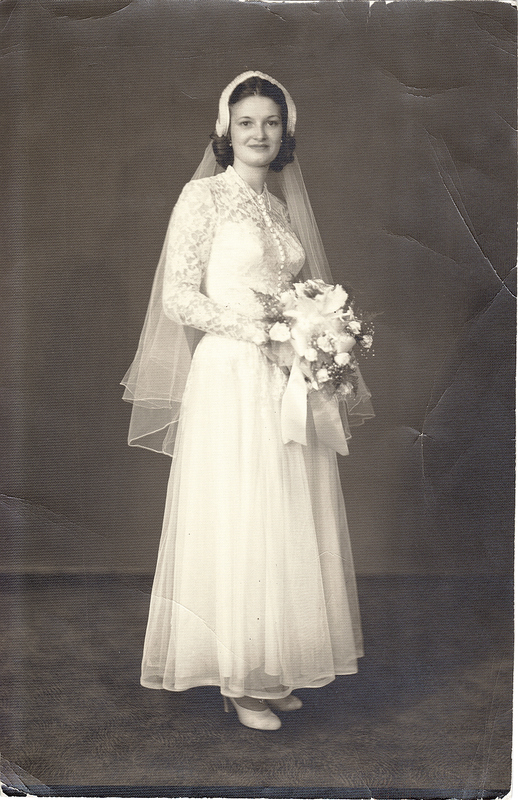 In my case, I have no discipline and thirty seven years later everyone is still asking when my baby is due. . . .
A photo of Grace A. Britt on her wedding day in June of 1951. 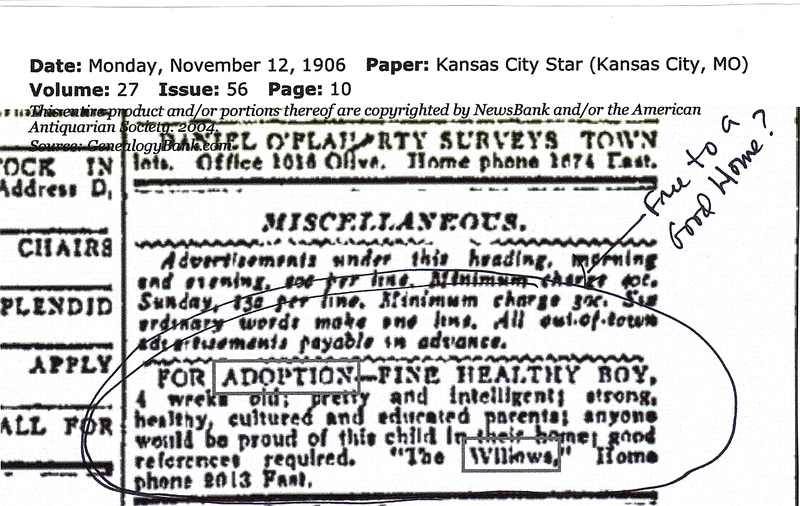 Two factors made Kansas City the “baby hub” of the United States: the railroads and only one child placement agency, the adoption department of the Juvenile Court. 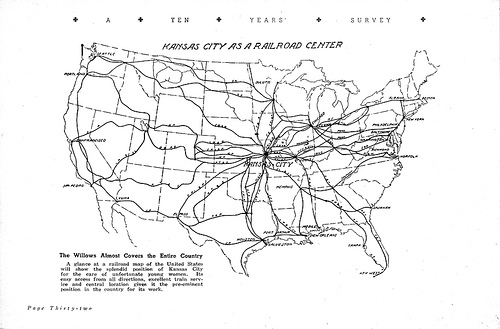 Parents from all over the United States used to pack their pregnant, unwed daughters onto the train and send them to Kansas City where taxis waited at the station to transport them to one of several maternity homes, including The Willows, Fairmount, St. Vincent’s, Florence Crittenton, Kansas City Cradle, and others. In 1929, “292 young women from 25 states slipped into Kansas City that year to give birth at The Willows, the city’s largest maternity home.” And scores more came to the others. When attitudes began changing in the 1960s and ‘70s, most of these homes closed. 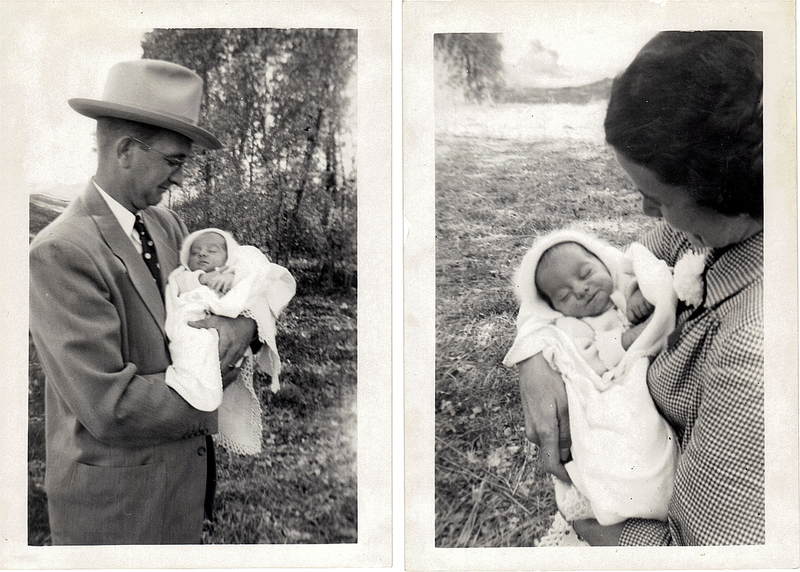 Because so many children were adopted in Kansas City during the first half of the twentieth century, the Missouri Valley Special Collections department receives numerous requests for information about the maternity homes and also about their records. We have information about the homes, but we do not have any records. The following excerpts are from a booklet titled “By-Paths and Cross-Roads; Accidents of Fair Travelers on the Highway of Life”, published by The Willows Maternity Sanitarium, primarily for physicians, copyright 1918 by E. P. Haworth. The Willows Maternity Sanitarium is an institution devoted exclusively to the care and seclusion of unfortunate young women, offering them congenial, homelike surroundings before confinement and exceptional medical and hospital care during delivery and convalescence. In most cases arrangements are also made for the finding of a home for the patient’s baby for adoption. The institution will not knowingly accept a young woman of the immoral or degenerate type, its service being reserved for worthy and deserving young women who have made a misstep and who face social and moral ruin. The Willows’ method is the safe, Christian and ethical solution to one of the most difficult problems of the medical community. Early entrance during gestation is important for preparing the patient for accoutrement through systematic hygienic methods and massage. A special system of abdominal and perineal massage has been originated for preventing striae gravidarum and as an aid to labor. The abdominal markings of a single girl, caused by carrying a child, are telltale signs that might be discovered at any time and cause her misfortune to become known. This combination of massages, including the skin, perineal and vaginal massage, has been successful in sending numbers of girls, who have taken them, away from The Willows without marks or signs to show of their experience. Gutter Snipe or Royal Offspring? As bends the sapling, so grows the giant oak. ‘Tis not the reversal of species, but the development of species the forester seeks and attains. 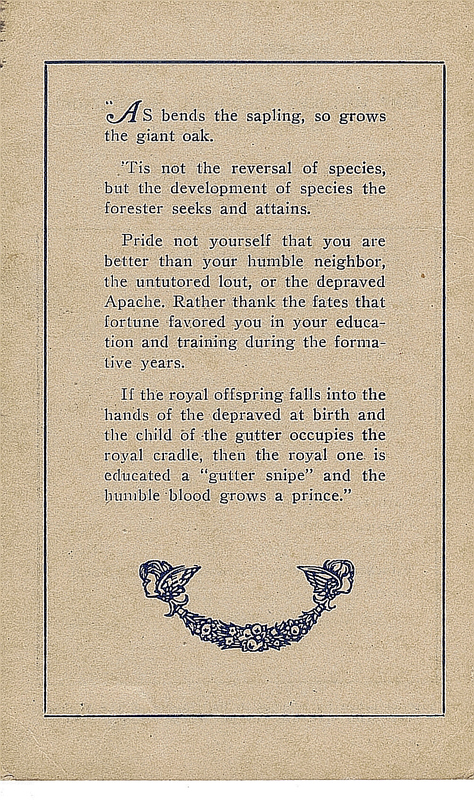 Pride not yourself that you are better than your humble neighbor, the untutored lout, or the depraved Apache. Rather thank the fates that fortune favored you in your education and training during the formative years. 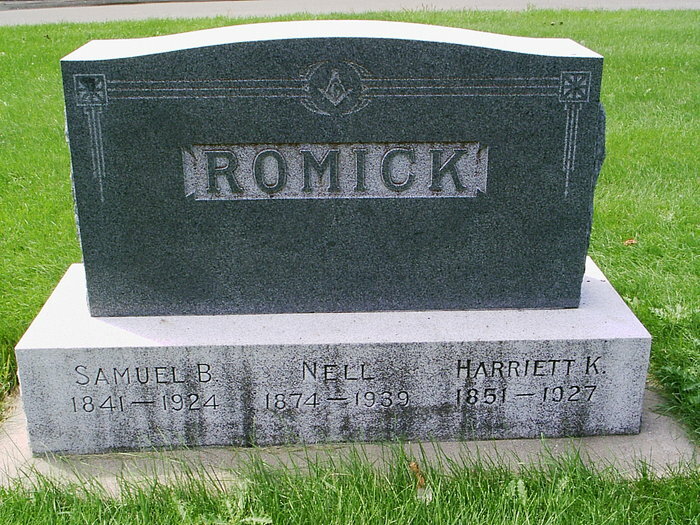 I have no idea how or why my biological mother picked The Willows Maternity Sanitarium, but she took a train by herself from New Jersey to Kansas City, MO. 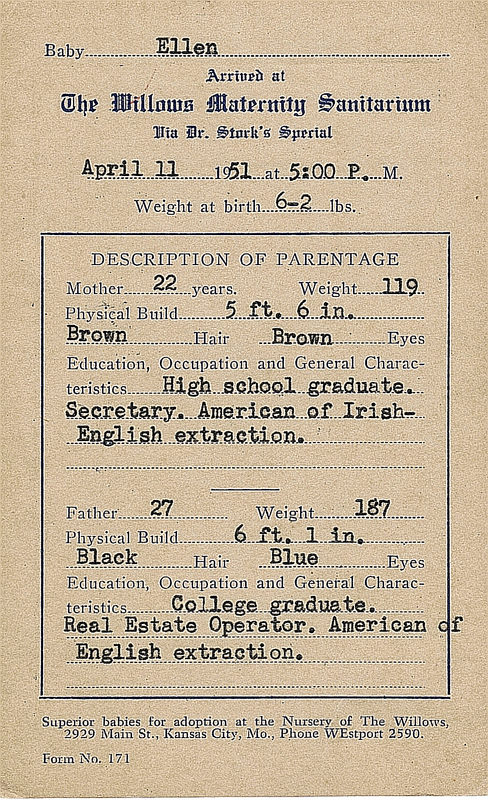 My adoptive parents were given the little card copied below, “Description of Parentage”. Where are the records for the Willows Maternity Home? 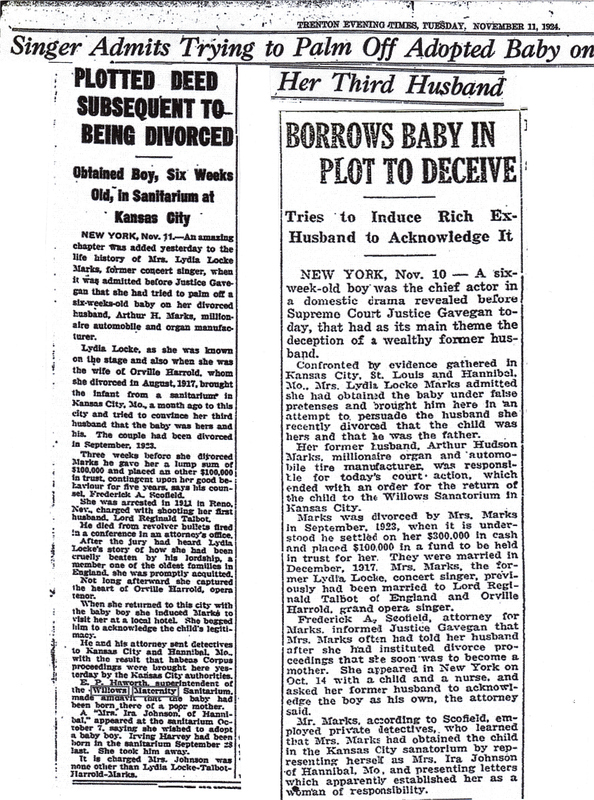 When the Willows Maternity Sanitarium closed in 1969, after 64 years of providing a haven and help for “unfortunate” girls and adoption services for their newborns, “the records were piled in the backyard and burned.” This statement, published in The Kansas City Star, June 22, 1975, was repeated again in 1982 by Mrs. Sam Ray about the Willows in the historical article that accompanied the postcard in her column “Postcards from Old Kansas City” in The Kansas City Star. 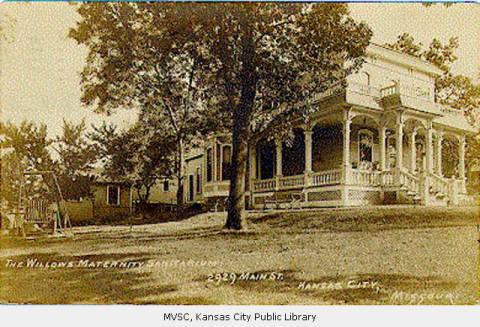 Pictured on a photographic post card in black and white, and dated Nov. 5, 1909, is the Willows Maternity Sanitarium, 2929 Main Street. The sanitarium was actually a home for unwed pregnant women in a day when the privacy of such an institution was sought. Such situations were not even discussed in polite society. The Willows was founded by Edwin and Cora May Haworth in their white frame home at 2929 Main. It was opened as a refuge for unwed mothers. Later the home was given a brick facade, remembered by those who rode the Main Street trolley cars downtown. A young woman who found she had been born and adopted at the Willows visited Kansas City in June 1975 and gave an interview to The Star. Let’s get it straight that it was no baby mill, she said. They were fine upstanding people who ran the home and only the most socially prominent Midwestern women were taken in. It had a lot of snob appeal. It was like the Ritz or Waldorf of homes for unwed mothers. It cost more to go there than it did to attend a finishing school. Pregnant girls were met at the railroad station and escorted in limousines to the steps of the Willows and remained up to eight months. Operation of the Willows was very strict. Not just every unwed mother could get in. They were recommended by prominent doctors throughout the U.S. The post card seems to bear out the last statement. The reverse side of the card, which was mailed to a Dr. Thomas J. Shreves, Des Moines, bears this printed promotional message: Dear Doctor: Our new steam heating plant and hot-water storage system is to be completed Nov. 15. (1909). Meanwhile we have heating accommodations adequate to properly care for our seclusion patients. At present we have 10 babies for adoption. Hoping to serve you when occasion arises, I am, fraternally yours, E.P. Haworth, Supt. At one time as many as 102 young women occupied the facility and as many as 125 babies were in the nursery, awaiting adoption. Some of the original staff included Dr. John W. Kepner, obstetrician from 1905 to 1931; Miss Hannah Dore, secretary; Miss Ada Jaggers, head nurse; Charles Laybourne, maintenance engineer, and Dr. Frank Neff, pediatrician. At the closing and razing of the Willows in 1969, records of its 64 years of operation were piled in the back yard and burned. It was the end of an era.